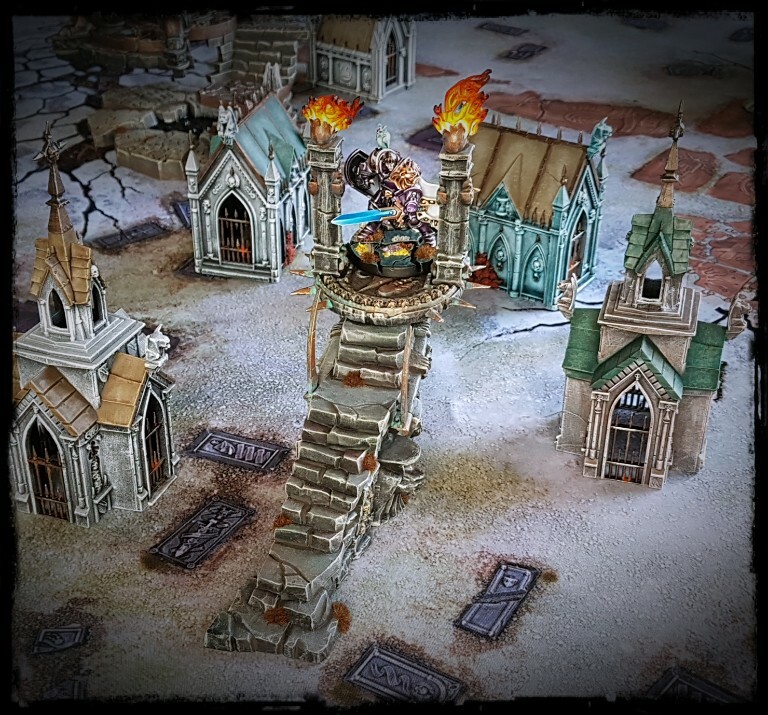 Upon release in 2012 I thought that this terrain piece and the entire range that it was from was utterly ridiculous. “You didn’t buy THAT did you? !” I snorted self-righteously at a mate when I saw a partly assembled Arcane Fulcrum sitting on his shelf in 2013. “That one isn’t even the worst one of those Storm of Magic things!” I said smugly. “Who the hell came up with the idea for [INSERT DESCRIPTION OF ANY STORM OF MAGIC FULCRUM]! ?” I snorted obnoxiously. 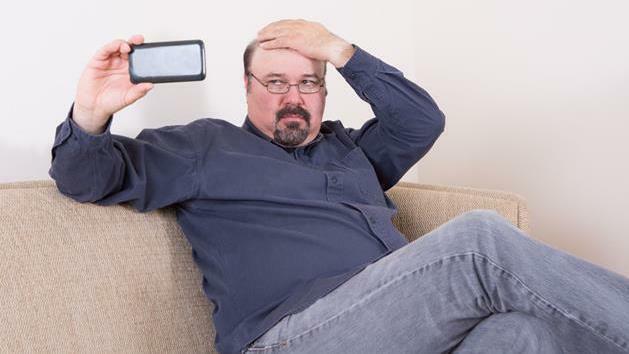 But then the mid life crisis started to really kick in. Middle age does weird things psychologically. I think that liking Storm of Magic terrain pieces stems from the same part of me that appears to have gone full circle with classic rock music. There is an undeniable Spinal Tap vibe to this genuinely peculiar terrain range and now, I simply like it. The official GW paint job for the Dreadfire Portal on release. I do not like it. It looks too much like a toy paint job. Im not sure at what point I decided that not only were the utterly over the top Arcane Fulcrums actually not rubbish. I must have been a gradual change, by degrees. The fact remains that at some point in the last four years I went to sleep thinking that fiery stairs that go nowhere and gigantic columns of skulls with thrones on them are “not cool” and woke up thinking that they are, in fact “cool”. At the time of writing, it is mid 2017. I spent a portion of the last year or so gathering the four Arcane Fulcrum terrain pieces via Ebay and much of my free time in the last month painting them. This Dreadfire Portal was the first completed. A lot of Cher went around in my head while painting this one. More unlikely architecture next time. I already thought they were cool before they were cool! Unfortunately they have been sitting unpainted ever since. Great paint job on yours, looking forward to the rest. I found painting the four Fulcrums very straightforward and enjoyable. I definitely benefited from painting them in a few sub assemblies though. Although the only things that I kept separate on the Dreadfire Portal were the flame elements. I’m glad that you like it Subedai! Lovely, this is one of my favourites. It’s the ultimate guitar solo platform. This one I do have, pristine and unassembled in it’s box while you moved through the strata of hate to love. It looks far more plausible when you don’t paint the stone skeletons like actual skeletons. Much as I want to evoke some of the Masters of the Universe atmosphere on my journey through the Mortal Realms, “toylike” isn’t what I want from my toy soldier paint jobs. The official scheme didn’t really make sense to me, even using the “a wizard did it” logic of the Mortal Realms. Haha! Brilliantly executed. Now lower the stonehenge! Where the moon doth rise with a dragons face? There will be two different versions of “henges” eventually. One a classic version and the other a more processed version, suitable for the outskirts of EXACTAMUNDO! The Arcane fulcrums are OTT but then again so is Storm of Magic. It’s WHF turned up to 11 and I think the fulcrums had to reflect that. Once again love the way Exactamundo is coming together. In retrospect the Fulcrums were either influences on or else symptomatic of the transition to AoS to come. AoS is WHFB turned up to eleven really, discarding the faux historical elements and heading straight for an almost entirely internal logic free, high fantasy akin to the dreams of a drug addled Jack Black. Or at least as I imagine Jack Blacks drug addled dreams to be. Looking back you can see the transition to Age of Sigmar happened with a lot of the circa 2013 realses, like the Mutilath Vortex Beast and Vilitch the Curseling. Good point about the Mutalith. The Curseling is pretty out there, but he has his roots in classic Chaos Warrior design really. But the AoS aesthetic is certainly there. I played a game centred around that bizarre thing last Saturday in fact, with many imaginary beings giving their imaginary lives to fight over a prop from a Meatloaf concert. Will you be at BOYL this year? 🙂 Yeah I will mate – you? It will be good to meet up! Awesome!! Too right it will – see you there mate! I’m also hoping to have my first ever game of WFB on Sunday, so that should be cool, but basically free for pickup games of Rogue Trader in and around that. How about you? What are you planning? Im bringing a limited number of figs (luggage limits etc), but I might be able to get involved in some RT. I’ll take a look at my schedule. Cool man – lookin’ forward to it! So glad you painted the giga-reapers to look like stone rather than look like stone that’s been painted to look like giga-reapers. Smart move. Likewise, painting the skulls to be brass skulls rather than bone skulls is great. There is historical precedent for decoration like that to be painted I suppose, but AoS is not historical. With a concept so daft that I heard a bad impersonation of an American mobsters voice saying “Can I int-er-est you in a stairs… dat goes nowheres?” when I bought it, it’s important not to push it further into absurdity than necessary. Therefore stone giga-reapers. Painting skull motifs in bone bugs me. I try to avoid it generally. I find that your paint job substantially improves the piece… but still not to my taste. Were I to work on one of these, I might break off one or both of the scythes to go with the aged stone look. The scythes are separate pieces actually, so can easily be left out of the build if desired. Well, I have to say that your paintjob makes it look cool. 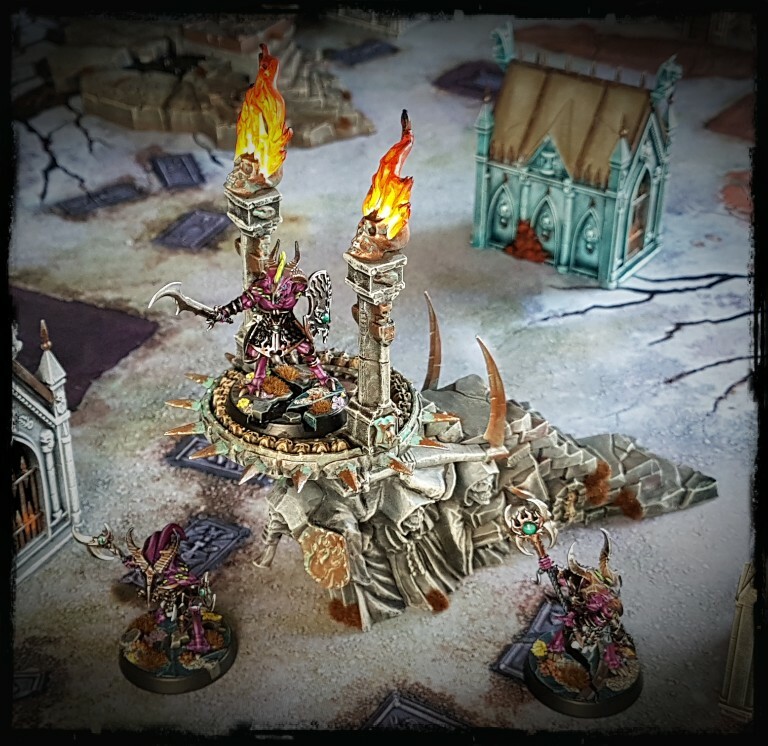 The evil pulpit appearance is awesome -maybe the flaming skulls are too much, but being a GW design they were to be expected. Really nice job! It’s “cool” in a Tenacious D sort of way I think Suber. Loveably ridiculous. 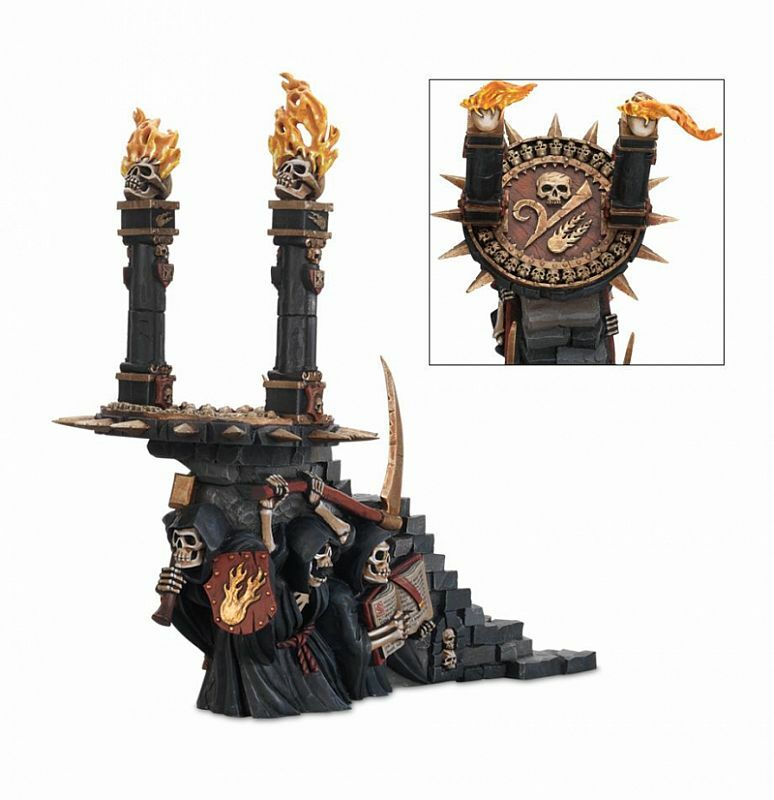 Without the flaming skulls on poles it would simply be a gaudy stairs I suppose. I’m not sure that would improve it actually. 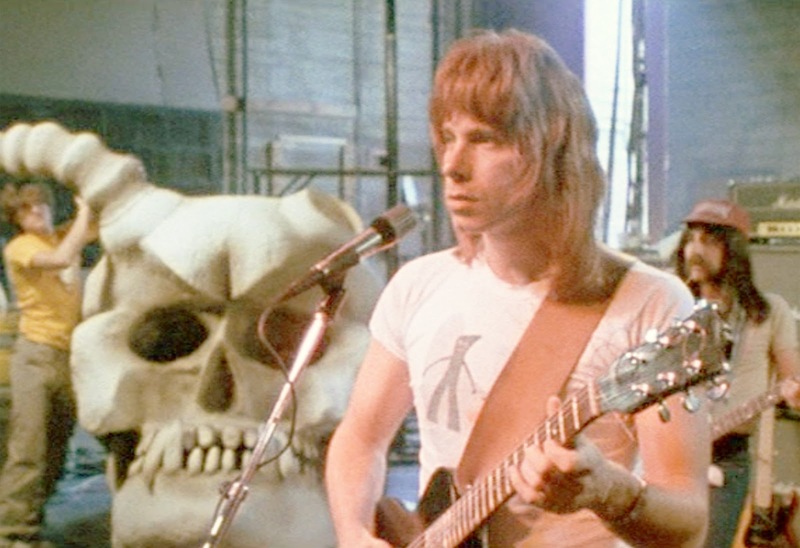 I briefly considered the possibility of painting the flaming skulls to look like the silk like fabric blown with fans to give an impression of flame on stage, but changed my mind. 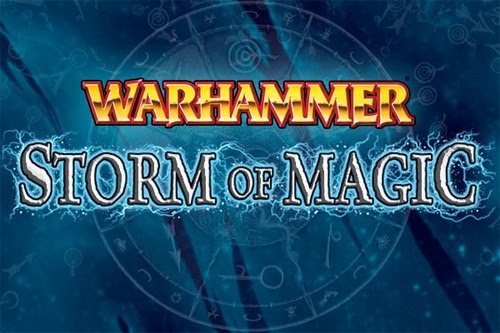 I agree with your sentiments and though I still prefer the old Warhammer, GW has got something good going on with the AoS world. The only thing that would make your photos better is if you got one with old Slaanesh noice marine shredding the guitar standing at the top of those stairs. Shamefully, my noise marines are unpainted. As for the Old World, I realised only recently that the faux historical elements of the setting had in fact put me off over the years. On some level that has only recently become clear to me, the various anachronistic elements had actually bugged me and limited the setting. I’m inconsistent in that regard though. Weird War settings are very appealing for example. I’m a trashy sort I suppose: the Mortal Realms appeal to me in ways that the Old World never did. What are the other buildings in the boneyard? I like those a lot! Those buildings are from the GW “Sigmarite Mausoleum” (previously known as the “Garden of Morr”) mrSpaceman. An excellent kit, thoroughly recommended.